Design processes are very personal. And regardless of what you were told in university about how you are supposed to do it, there is no right way if you are happy with the end result and the way you do it allows for the creativity you need. My collections are initially inspired by two things. The fabrics I can afford, and a design element that will feature throughout. So, several weeks ago I went to Leicester for my six monthly visit to stock up on off cut fabrics from the market. 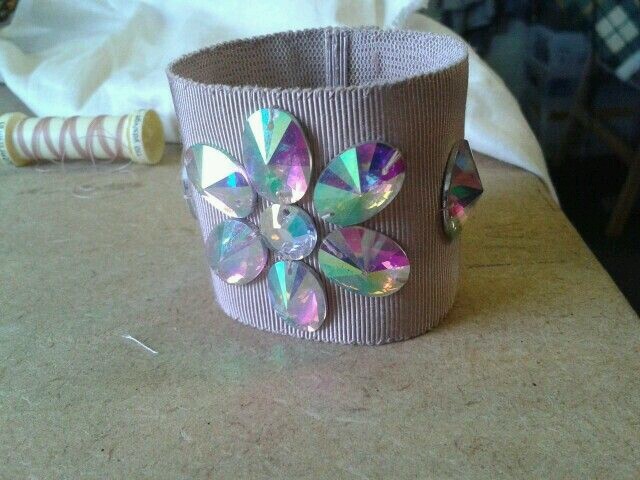 When I say off cuts this can be anything from 1 metre to a 30 metre end of stock roll. In many cases I get 5-7 metres of any one fabric which can potentially give me four or five outfits depending on what I am making. 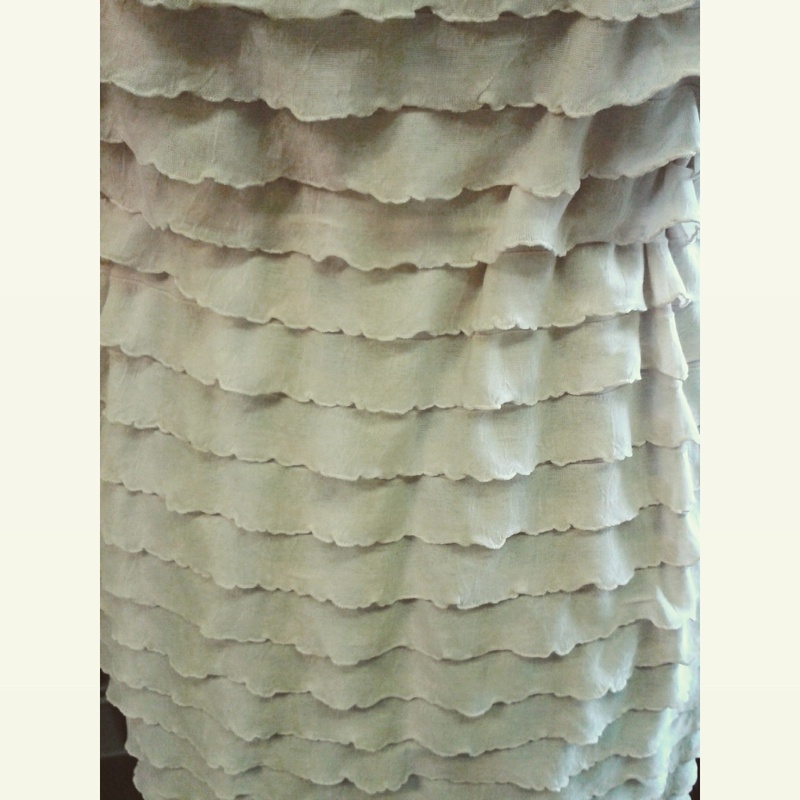 In this case I got a good sized length of this fabulous stone coloured frill fabric. It was inspiring but also limited in terms of usage so there was some experimentation involved. I don’t draw my collections first. It’s just not my thing, I am quite organic in how I design. I let the fabrics dictate how they should be used. But in this case I had doodled a few ideas before I got going because I wanted to replicate ideas from other collections I had made recently. 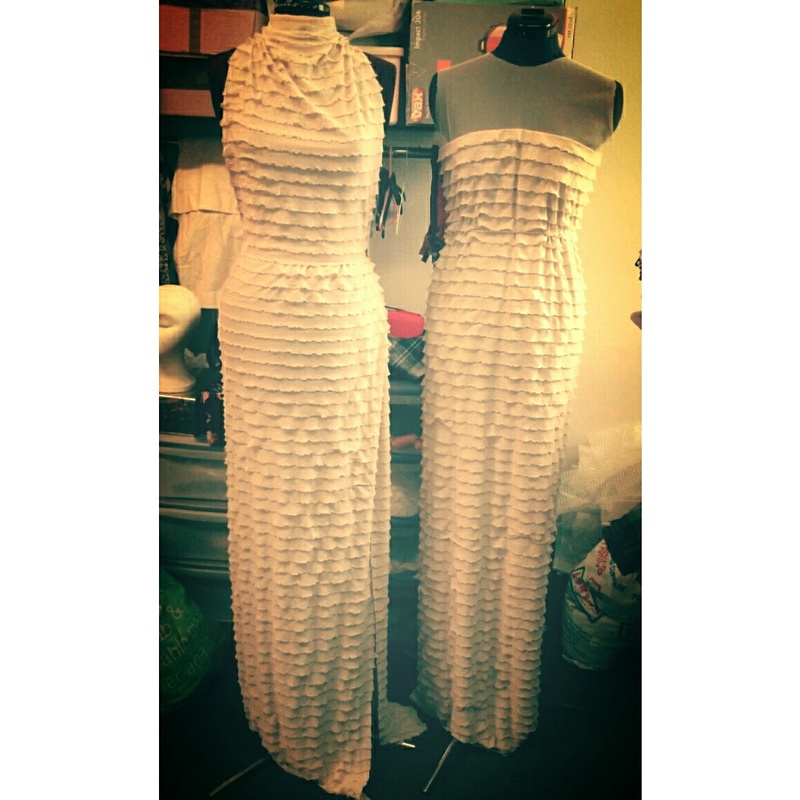 Generally, and because my designs are very free flowing, I simply play with the fabrics on the mannequin and see how they behave and look in certain ways and that inspires the design process. These long line gowns involve little tailoring which would ruin the way they look so making sure they work ‘seamfree’ is essential. 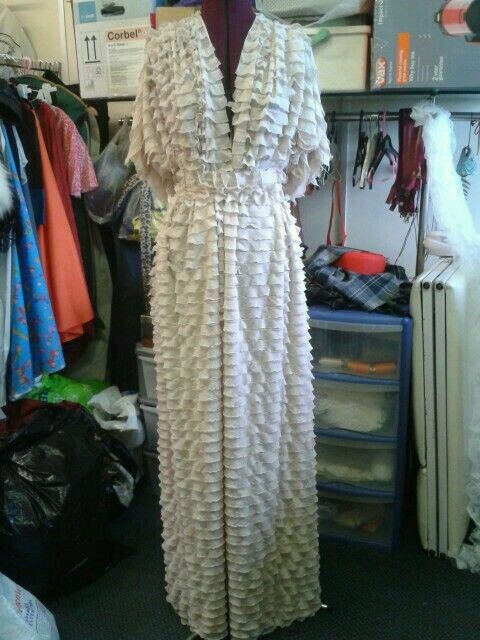 Collections take form quite fast because I am limited as to how many outfits I can get out of a particular fabric. I prefer this kind of pressure. I like the restriction of knowing I don’t have to complete reams and reams of ideas. These are essentially capsule collections – small snapshots of what they could possibly become if fabrics had no limit. For these sorts of dresses I like simple cuts and making the most of the fabric volume which of course limits the number of outfits but also means more creative thinking. Not always, but sometimes, accessories play a part. 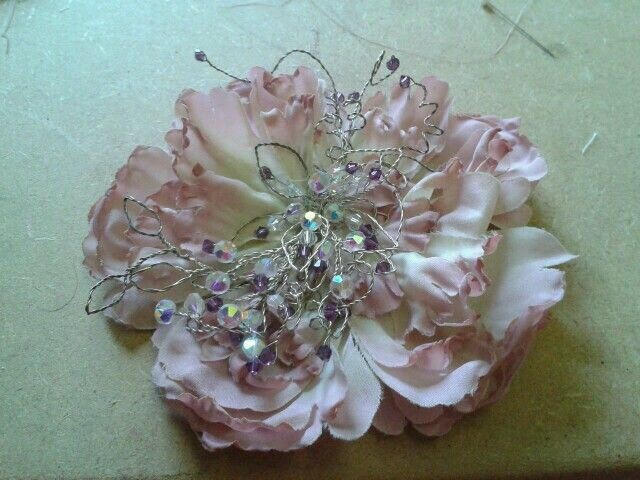 If I have items which lend to a collection then I will certainly integrate them into the look for a photoshoot. Accessory inspiration for this set included vintage ribbons and bead detailing which ended up as a cuff and a flower I had in my studio which became a choker. 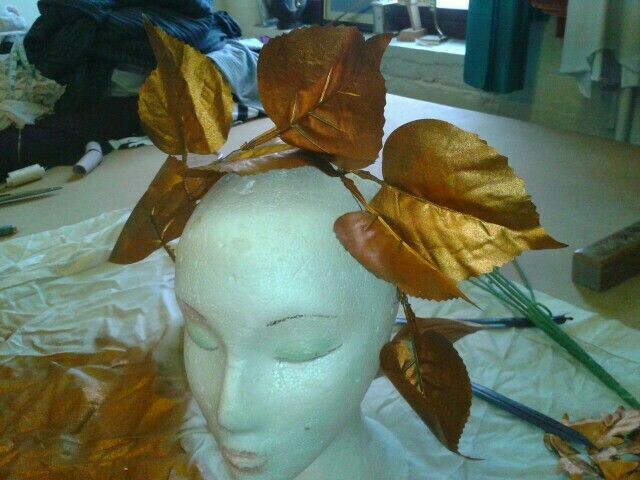 I had also been working on some paint sprayed faux leaves on another project and liked the blend of the metallic look so I turned the leftover leaves into a head piece. There is no shoot for this set yet. However, the wheels are already in motion. The end results will be fantastic as always thanks to all the creative people around me. I just need to set the shoot theme and we’re ready to go. Hopefully this collection will be shot late August or September.